Gary H. Lyman, MD, MPH, of the Fred Hutchinson Cancer Research Center/Seattle Cancer Care Alliance, discusses current strategies for the use of biosimilars to treat cancer-induced anemia and neutropenia, and the need to provide evidence for the efficacy of these agents to allay any concerns about their use. 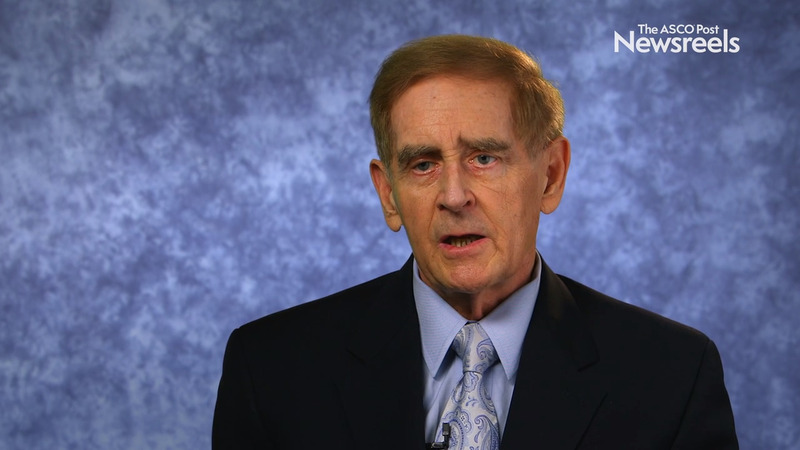 Alexander B. Pine, MD, PhD, of Yale School of Medicine, discusses a survey gathering data on health-care providers’ practices and preferences in using direct oral anticoagulant therapy to treat venous thromboembolism. Readers of The ASCO Post are invited to participate in this research by completing the survey, entitled: “Perspectives and Practices in Utilization of Direct Oral Anticoagulants in Patients With Cancer-Associated Venous Thromboembolism.” The survey takes approximately 3 to 4 minutes to complete and can be taken on a mobile device or a computer. The survey link is https://yalesurvey.ca1.qualtrics.com/jfe/form/SV_3l0HxrreWZhVtBz. Frederick L. Locke, MD, of Moffitt Cancer Center, discusses the key studies behind the development of CAR T cells, major adverse events and management strategies, and the potential of this revolutionary treatment. Meletios A. Dimopoulos, MD, of the National and Kapodistrian University of Athens, discusses phase III findings on ibrutinib/rituximab vs placebo/rituximab in Waldenström’s macroglobulinemia (Abstract 8003). Ruben A. Mesa, MD, of The University of Texas Health San Antonio Cancer Center, discusses the role of JAK2 inhibitors in treating polycythemia vera and essential thrombocythemia and how to develop individualized therapy based on risk stratification.